Miso Crafty Knits: What's this? I'm so happy today! 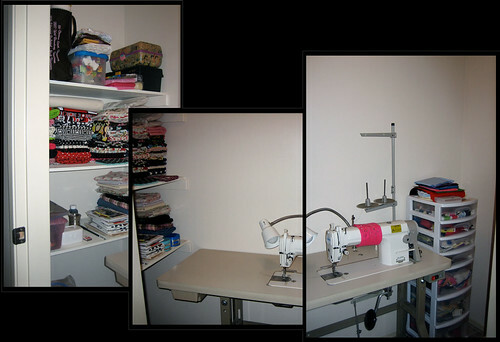 My sewing closet is finally unpacked and organized!! And I say "sewing closet" cause it literally is a closet. Our new house has so many closets, more than we know what to do with them! And since I've always wanted my own space for my beloved sewing machine and all my sewing and crafting supplies, Brett threw out the idea that maybe I could turn one of the bigger closets into a sewing space. I personally think he was sick of seeing my sewing machine and most likely didn't want it in the living room, or worse, in our bedroom. I have a Juki industrial straight stitch machine, so I can understand the reasons why he would suggest I turn a closet into my sewing room. Sorry for the crappy photos, I took them a few minutes ago (3am) and there's only one light on, and that's to the sewing room). The room is not completely set up the way I want it to be, but the machine is oiled up and ready to go and that's all that matters right now. I made a list of all the projects I want to do in order to get this room that way I want it. It'll be challenging as there are so many other projects that I have in mind...where to start??? Hmm, maybe I should finish the projects that I have started months ago first? If you look at the top left side of the photo, you'll see a bag...that's full of all my unfinished projects! Now that I've got my own space to do my sewing and crafting without having to clean up and put everything away every time I stop working for the day, it makes for easier sewing/crafting. I made a huge list of projects I'm going to try and do, and already have bought most of the fabrics and supplies needed for most of them! Since acquiring the space, my mind has been going into overdrive with ideas! Unfortunately they all come at me in the middle of the night when I'm breastfeeding my son and can't really write anything down. I've learned to keep a pen and paper near the bed solely for these moments. 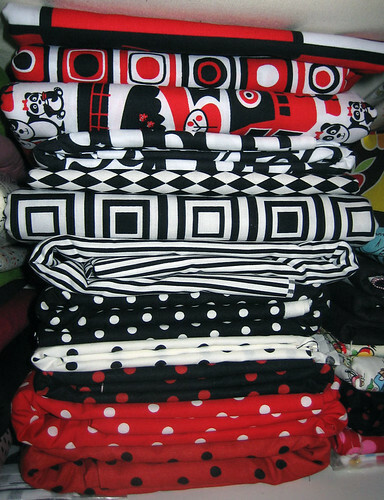 Anyways, here's a (messy) pile of fabric that is dying to be turned into something. Can you guess what it's going to be? Hehe- I sew in a closet too!! Welcome to the closet sewers guild! Hahahaa! I saw that on your blog, but figured that you had a way bigger closet than what I got and can get away with calling it a sewing room. Oh well, I'm just happy that I can sew away and not have to worry about threads being all over the kitchen or something like that. Brett's also happy that he doesn't have to see the piles of scrap fabric that I apparently like to have. Yay for the Closet Sewers Guild!